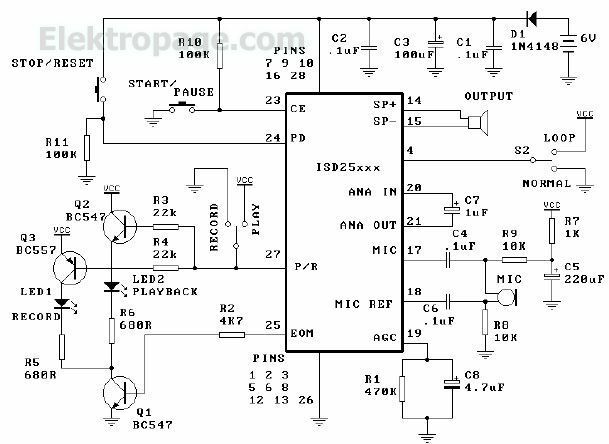 Using ISD25120 integrated circuit manufactured by Information Storage Devices we can design a very simple and interesting device that can be used to record sounds up to 120 seconds . The ISD25xx series circuits are specially designed to provide high-quality, record/playback for 45, 60, 75, 90 and 120 seconds. These cmos devices include an on-chip oscillator, microphone preamplifier, automatic gain control, antialiasing filter, smoothing filter and speaker amplifier. In addition it is micro-processor compatible allowing complex messaging and addressing to be achieved. Recordings are stored in on-board non-volatile memory cells, providing zero power message storage. To record a message you will need to put the SPDT switch into the Record position and just push & release the Start/Pause button to start recording. When the recording is on the Record LED goes on. To stop recording you need to push the Start/Pause button. If you want to record another message you need just to push the Start/Pause button again. When you put the switch to Play the messages will playback. Only one message will be played back at a time. You must push Start/Pause again to get the next message. If the Reset switch is pressed the internal address pointer back to the start of the memory space. Even if the circuit is unpowered the recorded messages will not be destroyed .This circuit must be powered from a 6 volts DC power supply circuit or batteries .